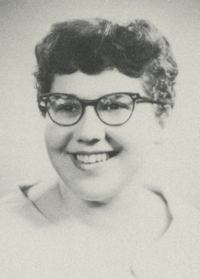 Obituary – Maxwell, Louise Margaretta (Bamberger) « Perry High School Alumni Association, Inc.
﻿Red Hots 54-57, Class Assemblies 54-56, Library Staff 54-55, All School Revue 54-55. Louise Margaretta Maxwell, 62, died Saturday, May 12, 2001, at Rosewood Nursing Home, Stillwater, OK.
Services will be at 10:30 a.m. Thursday at Strode Funeral Home with Dale Barnes Officiating. Interment will be at Zion Cemetery in Perry under the direction of Strode Funeral Home. She was born Feb. 27, 1939, in Lucien to Otto and Ada (Friedemann) Bamberger. She grew up in Perry, graduated from Perry High School and attended classes at Oklahoma State Universtiy. She married Ray Maxwell Sept. 30, 1961, in Perry. They later divorced. She was a former choir director for Zion Lutheran Church in Perry and president of Luther League. She was involved in many activities prior to her illness in 1980. She had a positive attitude in life and was always cheerful and smiling. She was an inspiration to many people and touched their lives in a special way. She was a member of the New Covenant of Life. She was preceded in death by her parents and former husband. Survivors include two daughters., Jane Maxwell of Stillwater and Tammy Bates of Tulsa; three grandchildren, Robin Bates and Christopher Davis of Stillwater and Trey Bates of Houston, Texas; one brother, Paul Bamberger and his wife Julie of Stillwater and a special friend, Lawrence Williams.